The Fitness Center of the Future is another unique space that MaST offers students. Featuring multiple televisions for Wii Gaming activities, areas for working out, and a large projection screen for whole group learning, the Fitness Center is a space utilized by all K-12 students. 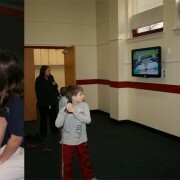 Students enjoy a variety of fitness games and compete against each other during class time. 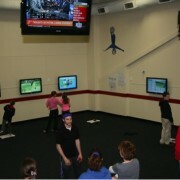 The space is also used by sports teams for after-school training purposes. Students and staff are also able to use the Fitness Center after school. The Fitness Center of the Future is a great addition to MaST and allows for social interaction while encouraging healthy habits. This unique space combines the futuristic idea of health and wellness being incorporated into multiple levels for student fitness and interaction. 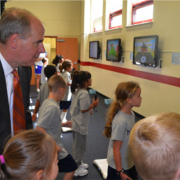 The center is usable by all students in grades K-12 and boasts weight machines, Wii Fitness video game interactions, and fitness boards. One goal for the future is to allow students to track their usage and goals within the center, which will be tied to the curriculum. Students learn best when they are involved in their learning via creative measures, which demonstrate that learning can be fun too. Our students exercise in new ways and this concept will prove that being healthy is a great option for their futures.